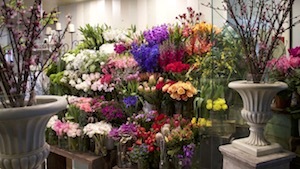 Are you looking for a Burns Bay Road Lane Cove florist? Pure Flowers is here to help! We deliver gorgeous blooms from our award-winning flower shop to Lane Cove and surrounding suburbs. Are you looking for a florist on Burns Bay Road? We are here to help! Pure Flowers has been a Lane Cove institution since 1995. We are thrilled to be the finest Lane Cove florist - 2018 Fresh Awards for Service Excellence and Northern Districts Local Business Award Winner. We’re known for only creating the very best and longest lasting floral arrangements, whether it’s for your weekly floral refresh, to cheer up a friend, welcome a new baby or send Happy Birthday flowers. We hand-select our favourite fresh blooms from Sydney Flower Market and use them to create gorgeous hand-tied bouquets, lovely vase arrangements and pretty posies. Whatever the occasion, we can deliver gorgeous fresh flowers from our award-winning flower shop to Lane Cove or Sydney wide. Place your order by 11am weekdays and 9am Saturdays for same day delivery. Ordering is easy – visit us, buy online or call 02 9427 8214. Our flower shop is open six days a week. You’ll find us in an arcade off the Lane Cove Plaza, between Baker’s Delight, Guzman & Gomez and The Cake Man café. If you are planning to drop, read our carparking tips. But, so you can order flowers whenever it’s most convenient for you, our online store is always open for shopping. We love selecting the freshest blooms from the Sydney Flower Market as soon as the doors open and whisking them to our store to create bouquets, arrangements and designs for every occasion you can think of. You may see us unloading the van early in the morning on market days. We have stunning posies and bouquets ready to go or can make up something quickly with your choice of blooms if you drop in on your way home from Lane Cove plaza. If you’re pressed for time, just telephone ahead or order your flowers online whenever suits you best. Whether you do get the chance pop in to see us, or buy your flowers online, our team will craft your order in our Lane Cove florist boutique and get one of our favourite and lovely couriers to deliver them wherever in Sydney you need them to go. Kamillaroi Retirement Centre, St Columba's Retirement Centre, Lynwood Nursing Home and Caroline Chisholm Retirement Village. While you are here, read about our local flower walk in pretty Riverview. As your local Lane Cove florist, we’re here to discuss any special requests, shoot the breeze about the latest in floral fashions or just simply have a coffee and a chat. We’d love to see you soon!